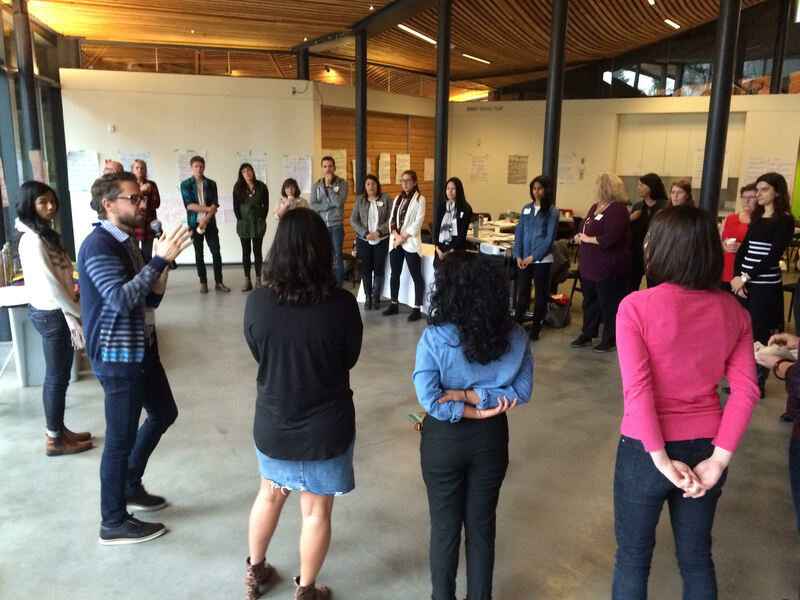 This article describes some of the learnings and interactions during a 2-day workshop in Vancouver in March 2018 on the topic of a Human Rights Based Approach (HRBA) in development. “I’ve had a big shift in my thinking,” one participant said; “a human rights based approach is a sustainable way to do development. Human rights adds “teeth” to what you are doing to support the Sustainable Development Goals,” added another, as we went around the room hearing from the nearly 30 people gathered on a rainy Vancouver morning. Chart paper was hung up all over the meeting space, the different handwriting showing people’s ideas on display. A wall with everyone’s names and areas of focus showed diversity in development interests – from education, to networking, to health, to immigration – the knowledge and experience spanned all over Canada and the world. “When you study or learn something, it changes your perspective permanently. I hope this changes my work going forward” another person offered. “I realized that human rights are at the foundation of the work we are doing” came another affirmation. This group of people came together to participate in the 2-day workshop, “Implementing a human rights-based approach” – coming from as far away as Halifax and Whitehorse, and as close as Kelowna, Victoria, and the Vancouver area. The participants formed a large circle, reflecting on the day before where they had a whirlwind introduction to United Nations human rights system, as well as the standards and mechanisms, and then applied their new knowledge to some case studies. Several people spoke to how they were impacted by a case study from Action Aid’s “People’s Action in Practice” which illustrated the differing results between using a “needs-based approach” to development and a “human rights-based approach”. The example focused on actions aimed at improving children’s access to education with an expenditure of £20. In a “needs-based approach”, the £20 could be used to purchase a part of a uniform for one child to go to school in Kenya. Using a human rights-based approach would involve identifying the human rights issues, drilling down to root causes and identifying actions leading to more sustainable results. Adopting a human rights-based approach in this case, therefore saw the £20 used to pay for the travel costs of two children to go speak to the national parliament in Kenya. This resulted in the education minister writing to 17,800 primary schools to say that lack of uniforms should not prevent access to school. This case study embodied the “5 elements of a human rights based approach,” which can be remembered with the acronym PANEL: Participation, Accountability, Non-Discrimination and equality, Empowerment, and Links to human rights. The case study also demonstrated another concept introduced that day – the idea of seeing the roles of “rights holders” (the children) and “duty bearers” (the NGO, the government) in acting to affirm and protect human rights. Many people nodded their heads and murmured agreement when the example was brought up as an effective demonstration of a human rights-based approach. Through the day, the workshop participants analyzed their own projects to practice integrating a human rights-based approach. Asking questions like: who is ultimately responsible for upholding the rights of the people meant to benefit from the project? (Usually their government). What UN treaties or other legal obligations has the country in question signed onto that could be used as an entry point for upholding human rights? (There are often many). Who should be participating in consultations about development projects that interlock with human rights? (Usually the people who the project is meant to help). Human rights are protected through United Nations treaties that governments have ratified and incorporated into their domestic legislation. These are powerful moral and diplomatic tools for improving people’s lives. Not all UN documents are legally binding, but there are enough with domestic legal ties to help keep governments and other duty bearers accountable to people and communities. This accountability seems to be the main goal of a human rights based approach. As people worked through the last parts of the workshop they spoke easily to each other, discussing their ideas with new vocabulary, and building on each other’s comments. As the day came to a close something hopeful said at the beginning of the day became apparent: “In many cases, we are all already doing much of this work” – and a human rights-based approach will enable more sustainable results, now and into the future. The “Implementing a human rights-based approach” Workshop was offered through a partnership of the BC Council for International Cooperation, Equitas International Centre for Human Rights Education, and the Canadian Council for International Cooperation (with support from the CSO Partnership for Development Effectiveness). Access to workshops and training is a benefit of BCCIC membership – become a member to connect to the Global Development network in BC.